Sarah has apparently just met Jerry… she followed him UP the stairs, then at the 1st floor she decided to take the elevator up. Well we’re all moved in now. It’s a bummer that I didn’t get to finish up with the odds and ends of unpacking before I left for tour, but that’s the way it goes. So far we’ve met some nice people at our new place, and some not-so-nice. Also some characters. We happened to run into the president of the HOA by the pool and were talking about some of the people we had encountered. I expressed some amused concern over an old dude I had seen the day previous walking around the parking lot wearing a t-shirt, sandals, and nothing else (might I add that the t-shirt was nowhere near long enough). To which our worthy president grinningly replied, “Oh! That’s just Jerry,” with a look as if to say, “Yeah, that’s his way, nothing out of the ordinary for ol’ Jerry.” Well for my part I hope not to gaze upon those pastures again. Our new place is mostly great with a few quirks. It’s almost 50% bigger than our last place which makes it feel quite roomy. So much so that we might need to get some more furniture to make it feel less empty. The only thing that really leaves me bewildered is the bathtub in the master bathroom. It’s ridiculously huge. I’m told that a bathtub that ginormous will be a great boon to me when I become geriatric, which is all well and good, but I feel like I have quite a few years left in me before my withered limbs and slowness require a tub of those colossal proportions. That space would have made a great billiards room. 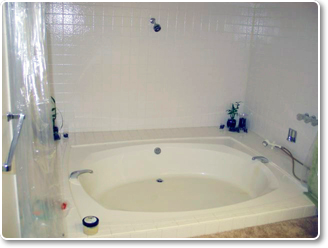 Here’s a picture of said bathtub. 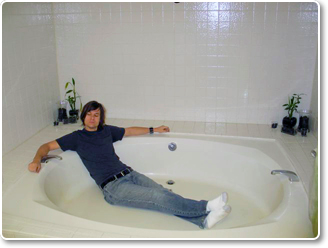 And, for scale, here’s a picture with me in the tub. I feel like if it were filled with baked beans it would be straight out of Double Dare. Listening to "Tearing In My Heart"
Ok so I’ve decided to update my blog again. This time I moved to a WordPress installation at the recommendation of my friend James. Hope it’s not too horrible on the eyes. I’m at home now with my lovely wife, just chilling and swilling and packing. Today we got the go-ahead on a new place about 5 miles from where we currently live, so Monday will find us moving in, forgetting things, remembering them again, and generally being crazy. We’ve been looking for a better neighborhood for a while since our cars keep getting broken into (see this for reference). Now it’s nice to not have to look anymore :) Woohoo! Listening to "Casimir Pulaski Day"